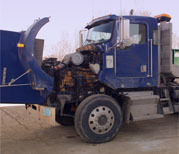 The Electronic Control Modules employed by heavy truck engines manufactured by CATERPILLAR, CUMMINS, DETROIT DIESEL,MERCEDES and others may have the ability to store incident information. These data may include such parameters as wheel speed, brake use, clutch use, throttle use, engine speed, and general programming configuration. Following a crash, this information can be extremely valuable in determining how and why the incident occurred. GLCA staff have historically been involved in heavy truck EDR research and testing. The results of these endeavors have been published in the Accident Reconstruction Journal and in technical papers presented at the 2010 and 2011 Society of Automotive Engineers World Congresses. GLCA personnel continue to work with those who perform research in this field and maintain the ability to access heavy vehicle EDR's. Some modules may be accessed off of the vehicle and safely downloaded with either a simulator or direct cable download. It is however, preferable to access the ECM while it remains on the vehicle. Special precautions must be taken to prevent fault codes or other actions that may overwrite data currently stored on the module. GM ACM The GM Airbag Control Module will store up to 8 seconds of pre-crash information. 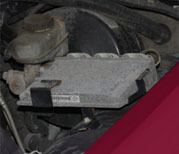 Ford PCMA Ford Powertrain Control Module can store up to 25 seconds of incident data. Heavy Truck ECMHeavy truck Electronic Control Modules can record over 90 seconds of crash information. 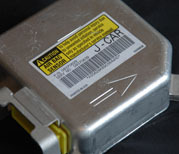 Following a crash incident, EDRs in certain ACURA, AUDI, BMW, CHRYSLER, FIAT, FORD, GM, HONDA, INFINITI, ISUZU, JEEP, LEXUS, MAZDA, MERCEDES BENZ, MINI COOPER, MITSUBISHI, NISSAN, SMART, SUZUKI, TOYOTA, VOLKSWAGON and VOLVO vehicles may store information surrounding the event and accessed with the Bosch Crash Data Retrieval System. Data from KIA, HYUNDAI and SUBARU may also be downloaded with separate proprietary tools. These data can include up to 25 seconds of speed, brake use, throttle input, engine speed, and seatbelt use information. This assists crash reconstructionists and engineers in analyzing the collision from all aspects of the event. Our personnel have received specialized training in the field of passenger vehicle EDRs, and have been involved in validation testing. This experience and study allows us to provide an informed analysis of recovered data. When imaging data, our staff can access the applicable module while it is in the vehicle or the EDR can be shipped to us for information retrieval. In most cases, when an ECM is removed from the truck for downloading at a different location, crash data is likely to be erased. This occurs when the ECM is powered without having the engine sensors connected. To prevent this, GLCA works with those who have developed and tested electronic harnesses that simulate the various engine sensors. Crash data can therefore be safely recovered if the ECM is removed from the truck. With Caterpillar, Detroit Diesel, and Mercedes-Benz engines, data WILL be lost if the ECM is accessed without using these specialized harnesses. The process of recovering crash data is a forensic specialty. It should only be done by persons properly trained and experienced in recovery and evidence spoliation issues. 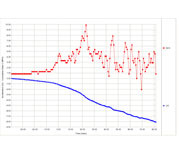 The use of data from an EDR such as this Detroit Diesel ECM can help to show how and why a crash occurred. GLCA personnel are trained in both the extraction and interpretation of EDR data.